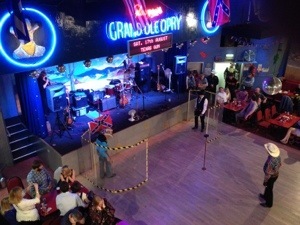 One of us mice’s favourite Glasgow places is the Grand Ole Opry! It’s a total institution. Most of the regulars seem to have been going there for years and usually we are by far the youngest people in the place. 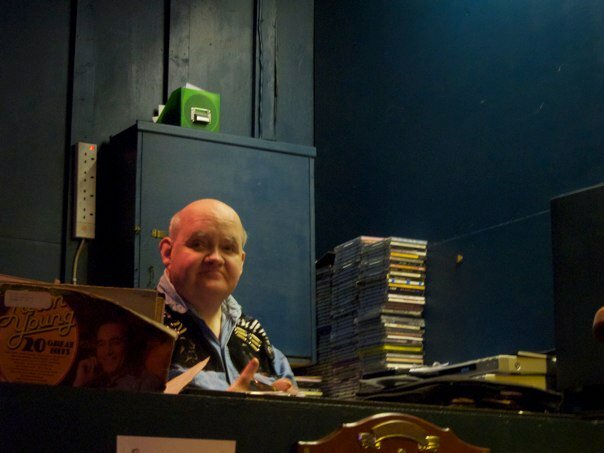 When we first started going, we were worried that, because we weren’t regulars, we wouldn’t be welcome, or that we might accidentally come across as disrespectful in our charity shop cowboy boots and denim shirts. That absolutely is not the case. The photo above is from a few years ago now. Richy, Hazel and I have birthdays close to each other, so we had a big collective night out. 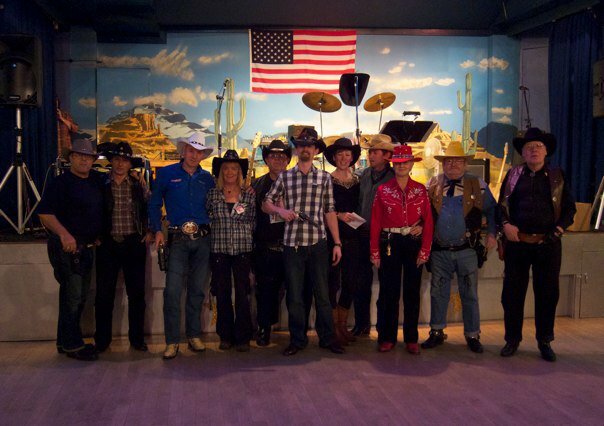 In this picture, we’ve just been given birthday cards and they let us pose with the gunslingers (more on that in a minute). One of them even let Richy hold his gun!! So, as well as being really welcoming, I like that every night has a schedule. 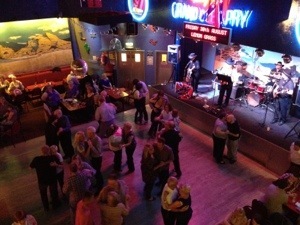 The band plays and everyone dances (you can see the DJ – his name is Rowdy – dancing just in front of the stage. He’s awesome.). Sometimes there are charity games like this one, where you had to shove a coin as close to the bottle as you could. The lady in red is another of my favourite Opry characters. She calls herself Line Dancer (although I’ve never seen her indulge in anything so frivolous). She usually adjudicates the shoot out (I’m getting there!) and she always has super-coordinated outfits. She also never seems to smile. Fierce. 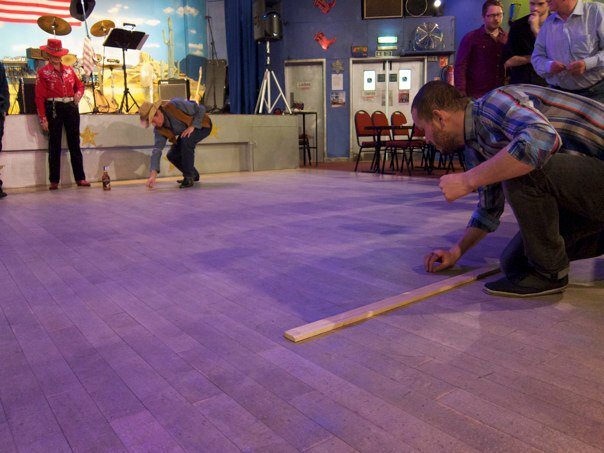 Then there’s the bingo, the raffle and… the shoot out! 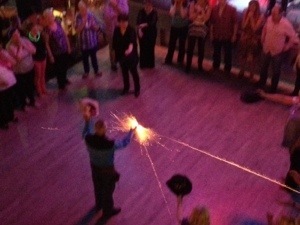 Yup, they have a gun club here one night a week and the regulars practise their quick draw. They all give themselves amazing gunslinger names like ‘Billy the Kid’, ‘John Wayne’, ‘Tennessee Lady’ and ‘Mountain Man’. It’s brilliant. 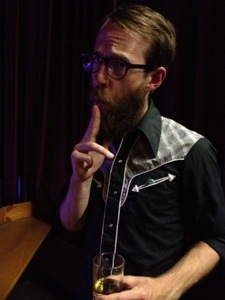 We always have a brilliant time and it’s a great excuse to get our cowboy glad rags on and drink cheap single malt whisky! 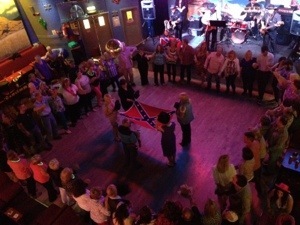 At the end of the night, they have a slightly disturbing ceremony where they play ‘An American Trilogy’ and everyone stands in a circle while five of the regulars very solemnly fold a Confederate flag. Once it’s folded, they ‘salute’ the flag with a gunshot. This part of the Opry experience has a bit of a strange feel to it. Is it racist?! Well, anyway, we usually sit it out and get back on the floor when it’s dancing time again. It seems pretty incongruous to have a place like this in Glasgow, but it works and I love it!